In the upper path of this window you can see the Calendar preview. 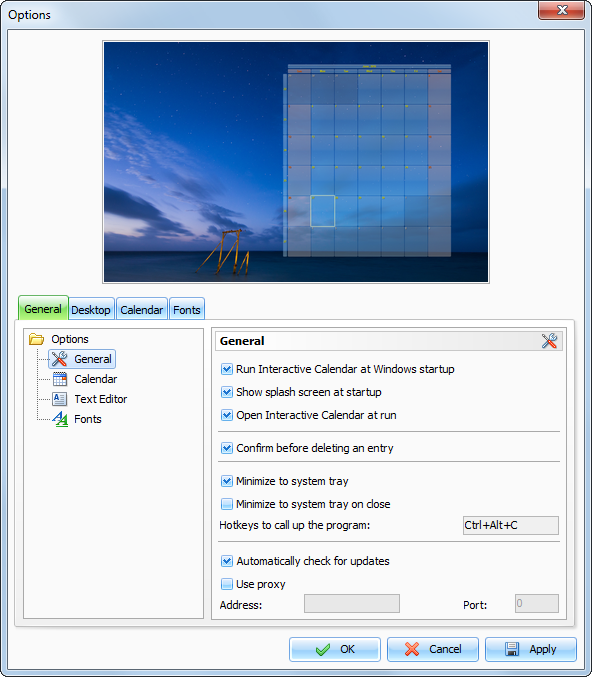 Run Interactive Calendar at Windows startup - allows or forbids the automatic program launching upon Windows startup. Show splash screen at startup - turns on/off the function of showing splash screen at Interactive Calendar startup. Open Interactive Calendar at run - if this option is active, the program will open at the desktop at each startup. If this option is turned off, when the program is launched it automatically minimizes to the system tray (near the Windows clock). 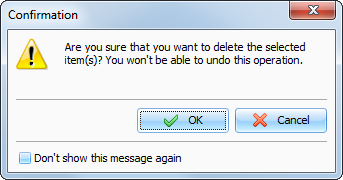 Confirm before deleting an entry - if this option is active, a dialog box with the confirmation request will appear before deleting any entry from a database. Minimize to system tray - when this option is turned on, Interactive Calendar will minimize to system tray when you minimize the main window. Minimize to system tray on close - when this option is turned on, Interactive Calendar will minimize to system tray when you close the main window. Otherwise Interactive Calendar will be closed if you close the main window. Hotkeys to call up the program - here you can enter the keys, which call up Interactive Calendar from the system tray. Automatically check for updates - when this option is on, Interactive Calendar will connect to http://www.csoftlab.com website and notify you, if the new version is available. You can also check for updates manually by clicking the "Help - Check for updates" main menu item. Use proxy - turn this option on and set up Address and Port, if you would like to use a proxy-server.